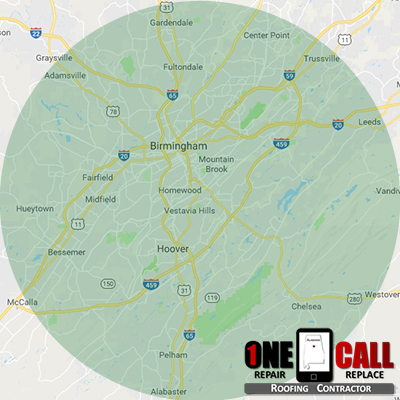 As the largest city in the state, Birmingham, AL continues to be our number service area when it comes to the roofing services we provide. Whether your located in the heart of downtown or on the outskirts in Cahaba, we’re standing by 24 hours a day and ready to serve you. With some of the most sought after schools and communities, Hoover, AL is has quickly grown to be the largest suburb just outside of Birmingham. This location calls on our professional roofing services so frequently, we call it our second home. Truly one of the more coveted addresses near Birmingham, Vestavia Hills is actually located in two counties, Jefferson and Shelby County. This community of older homes uses our roof repair and roofing replacement services on a regular basis. With a population of more than 34,000, we’ll be serving this city for a long time to come. Located in the southeastern portion of Jefferson County, Homewood is one town close to Birmingham that is being transformed and restored. As more people are buying and restoring these unique and older homes, we’re called on to replace roofs that have been long over due for removal. This affluent, upper middle class suburb of Birmingham is home to some of the most architecturally interesting properties in the area. Mountain Brook residents often call us for roof repair or replacement of cedar shake shingles, slate and tile and even copper roofing. Our expert craftsmen can service these specialty roofs properly. Nestled in Shelby County, Pelham occupies 38.3 square miles of land and has only been incorporated since the mid 1960’s. That said, some of the most beautiful residential subdivisions have sprung up including, Balantrae, The Glen At Stonehaven and many more. The elevation of this area makes it prone to windy weather which often relies on us for emergency roof repair. Another two county suburb of Birmingham, Trussville straddles Jefferson and St Clair Counties. With house subdivisions galore and an easy commute to the city, we’re certainly no stranger to the area. Many of the homes that were built 15 to 25 years ago need a new roof replacement and the steady flow of calls we get from the area attest to it. Located at the end of the Appalachian Foothills, Alabaster was named for the white calcium carbonate mineral that was mined there. Residential communities have grown substantially there as a quiet respite from the hustle and noise of the big city. Our roofing service calls to this town have increased steadily over the past few years.